Readers will delight in this warmhearted novel by bestselling author Jerry Eicher (more than 350,000 books sold), a former Amish man, who writes with authenticity and compassion about the people he grew up with. Susan Hostetler a young Amish woman who had left her community for life in the outside world, returns home to her family with her English friend, Teresa Long, and Teresas newborn, fatherless son. Teresa has come in hopes of settling with the Amish people. Deacon Ray gets wind of the situation and forbids the unwed mother from attending the church services, fearing she will pollute the young people of the community. Susans estranged boyfriend, Thomas Stoll, who still has hopes of winning her back, fears the trouble with Teresa will drive Susan back into the English world. Thomas convinces Yost Byler, an old bachelor, to propose to Teresa and adopt her child after the marriage. When Yost visits Deacon Ray with his plan, Deacon Ray agrees to the idea and removes the restriction, allowing Teresa to begin attending instruction classes. Outraged at this turn of events, Susan is unable to persuade Teresa from her plans to marry Yost. Yet throughout it all, Deacon Rays son, James, notices the depth of Teresas devotion to the faith and to her son, and finds himself drawn to her. With two Amish men interested in her, Teresa has a decision to make...and so does Susan. Will Susan stay in the community she loves....or venture back to the freedom she enjoyed in the English world? 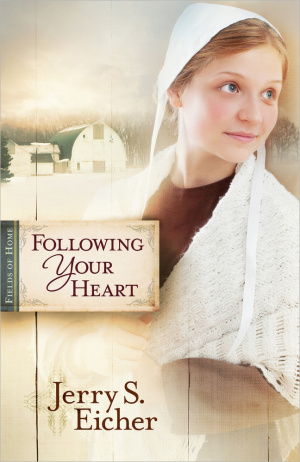 Following Your Heart by Jerry S. Eicher was published by Harvest House in May 2012 and is our 14420th best seller. The ISBN for Following Your Heart is 9780736944786. Be the first to review Following Your Heart! Got a question? No problem! Just click here to ask us about Following Your Heart.